Scotty Johnson arranges clothing outside The Sea Hag, a business she owns, as the Lakeview Village Shoppes in Olcott get ready for Saturday’s opening of a season in which, the town liaison says, “there’s something going on here” every weekend. OLCOTT – A string of eclectic specialty shops draws visitors to the boardwalk overlooking Lake Ontario in this tiny hamlet, while the lure of the nearby carousel and other old-time rides, special events, an expansive park and the promise of gorgeous sunsets can keep a family busy for an entire day. Business owners, preparing to open the Lakeview Village Shoppes for the season at noon Saturday, are coordinating their efforts to capitalize on special events planned for the area this year – and coming up with some ideas of their own, too – to give visitors even more reasons to extend their visits to Olcott. “Every weekend, there’s something going on here,” said Susan Neidlinger, a member of the Newfane Town Board, who acts as the town’s liaison to the shops. “The shop owners are coordinating special events to go along with these plans, at the Olcott Beach Carousel Park, at Krull Park, at the marina or along with town-sponsored concerts at the gazebo. The town built these 17 colorfully painted shops two decades ago and continues to own them, renting them to shopkeepers for $235 per month, while paying all utilities and maintaining their upkeep. The shopkeepers carry their own insurance. The Vacantis rent a double space, offering handmade items ranging from artwork to jewelry, with a “very large supply of gems, minerals and fossils,” Janet Vacanti said. She designs and makes jewelry from recycled materials, while her husband creates photo collages, and they both produce mixed media work. They also carry the work of other artists, as well as “free trade” items. Rory Calabrese has been on the boardwalk for 19 years, and her mother, Scotty Johnson, was one of the shops’ founding members with her Nature’s Child, which offers gifts recycled from nature. 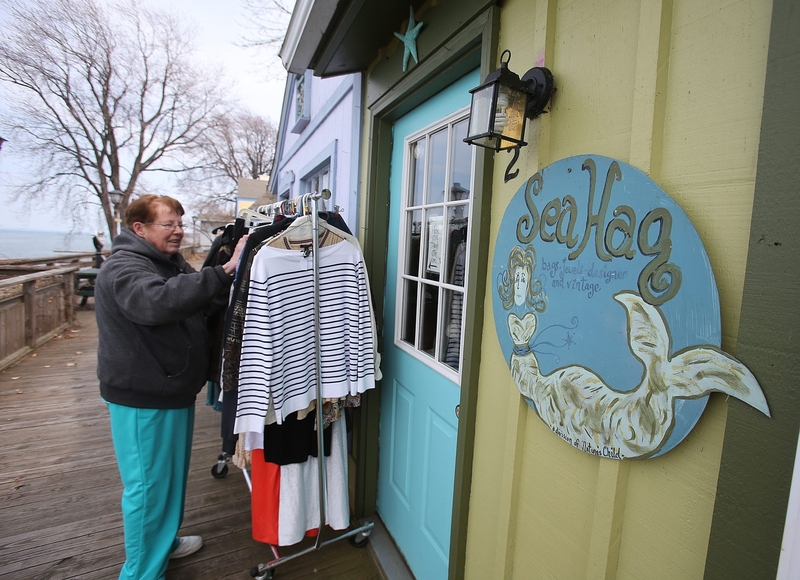 Six years ago, they also opened the adjacent Sea Hag shop, offering recycled vintage and designer clothing and accessories. “Our focus is recycled goods because it’s green,” Calabrese said. The arrangement has worked well for Calabrese, who brings her enterprising 12-year-old son, Robert Pucci, with her to work during the summers in Olcott, where he has a chance to sell his own items. A couple of years ago, she said, he earned enough selling Silly Bandz to finance a trip to Disney World. “Retail is fine, but it’s all about location, and we have prime space on this gorgeous boardwalk – it’s almost like a summer vacation working here,” Calabrese said. Neidlinger said the shops give people who might be thinking about launching a business a chance to try it for a season. “This is a good litmus test for someone to see if they want to start a business,” Neidlinger said. “And if they find they like it here in the summer, they may want to open a year-round shop somewhere else in town. Neidlinger said she filled the last of the shops in recent days. New this year are KM Treats Bakery, Up the Lake, and Oak Ridge Designs. Newfane and Olcott host a number of special events throughout the year, from car shows to the Niagara Celtic Festival (Sept. 13-14). The shops plan an “Eating Contest” at 4:30 p.m. Sunday, free flowers for all mothers on Mother’s Day and free apple dessert May 18 in recognition of Newfane’s Apple Blossom Festival. Looking ahead, Calabrese said, her shop will host a special art exhibit with 464 Gallery of Buffalo on Aug. 30. Lakeview Shoppes will be open from noon to 6 p.m. Saturdays and Sundays during the months of May, September and October. The hours are extended from Memorial Day weekend through Labor Day, open daily from noon to 8 p.m. Fridays and Saturdays and from noon to 6 p.m. Sundays through Thursdays.